When I looked into the items you’d find in a small town confectionery during this period, I was surprised by some of the things I did - and didn't - see. Some of the expected items on the list were butterscotch, peppermints, lemon drops and sugar plums. Marshmallows, gum drops and sour drops were a few of the things on the list that I didn’t expect to see - I hadn’t realized they’d been around that long ago. Another surprise - popcorn was classified as a candy during that period. One thing conspicuously absent from the lists were references to any sort of chocolate candies. Apparently, even though chocolate WAS around at this time, it hadn’t made into everyday use as a children’s treat. Most of the candies offered by a general store would be hard candies such as peppermint sticks, butterscotch, lemon drops, hoarhound candy or rock candy. I decided I’d prefer my heroine, however, to concentrate on softer treats such as bon-bons, taffies, nougats, gum drops and fudge. She also makes brittles and pralines. It was great fun coming up with a list of offerings for her shop! One thing I learned in my research is that fudge is an American invention. The exact origins are a matter of some dispute, but the first mention of it is found in a letter written by a student at Vasser College, Emelyn Hartridge. In the letter dated 1886 Emelyn mentions that the relative of a schoolmate made the confection and sold it for forty cents a pound. Emelyn obtained the recipe and made about 30 pounds of the sweet treat for a school fundraiser. It was a huge success and a tradition was born. In addition, I thought I’d share a much more modern version, namely my personal favorite. This is made the old fashioned way so it takes a bit of time and attention, but whenever I make it, I think of making it with my mom and sister back when I was just a kid - that always adds to my enjoyment of the treat. Add first four ingredients to heavy saucepan and stir to combine. Add mix, stirring until thoroughly mixed. Bring to a boil over medium heat, stirring continuously. Remove from heat and add butter and almond extract without stirring. When mixture reaches 110 degrees F, beat until fudge thickens and becomes less glossy. Quickly spread in a lightly greased pan (8 or 9 inch square works best). So tell me, what is your favorite confection? And to celebrate the October release of my book A Family For Christmas, I’d like to give one of today’s commenter an advanced copy of the book. Eve Pickering knows what it's like to be judged for your past. So she's not about to leave the orphaned boy she's befriended alone in this unfamiliar Texas town. Since Chance Dawson's offer of shelter is the only way to look after Leo, Eve is determined they'll have a warm, welcoming home for the holidays. Chance came from the big city to make it on his own despite a painful secret. But Eve's strength is giving him a confidence he never expected—and a new direction for his dream. With a little Christmas blessing, he'll dare to win her heart—and make their family one for a lifetime. What a scrumptious post! It is so interesting to learn of the candies of long ago. I find it especially interesting that popcorn was considered a candy. What fun to know that fudge is an American invention! I look forward to making the recipe you included and thank you so much for sharing. Milk chocolate is my very favorite and I love it in any form or fashion! I love Christmas stories and can't wait to read about Eve and her confectionery shop! 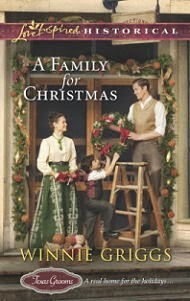 Thank you for the opportunity to win an advance copy of A Family for Christmas! interesting I knew fudge wasn't a traditional Aussie sweet (meaning it didn't come from England). I find Fudge very sweet and a little goes along way. I have to say I do like Rock candy I love the Raspberry flavour, and butterscotch. Oh and aniseed/licorice. I love going to places that have the olden days candy. I love to get a supply of raspberry drops and Aniseed drops. Hi Jenny! Good to hear from you. Rock candy always makes me think of Christmas at my grandmother's - she always had a big jar of it placed on her coffe table for the holidays. Thanks for sharing your family recipe, Winnie. What a great subject to research! I'm with Jenny--I love licorice as well. I made toffee last Christmas and found (sadly) that it was pretty easy! Congratulations on a Christmas story--what fun to write! Hi Debra - I'm a big fan of licorice as well. Every Easter my siblings would give me all the black jelly beans from their baskets because they hated them and I loved them! Except for the almond flavoring, the recipe is much like my grandmother's fudge recipe. She also made a divinity around Christmas time that I loved. I have never been very successful at it. In my research on chocolate, I found that homemakers didn't make candy with it and only companies like Hershey made candy. My favorite confection is pralines. I make them for gifts every Christmas as well as another favorite, chocolate covered pecan balls. Thanks for more info about confectionery shops. I still love going into them. I'm so glad the ones today have lots of chocolates. I'm looking forward to getting your book as I love Christmas books. I'm going to try the almond flavoring this year since I like almond in other things. I never realized something as common as a marshmallow was at one time considered a special treat! Thanks for sharing your research with us. Hi Mary. You're quite welcome and thanks for stopping by..
Fudge, what can I say, you gotta love it. It is one of my favorites and I still make my grandma's recipe sometimes. Not only that she had a recipe for One Minute Fudge Frosting, although I don't know the 'full' recipe I do know the 'one portion' recipe by heart, lol, so when I'm hungry for fudge I can make this little bit and it's fantastic! Thank you for the chance to win this Chirstmas book! Oh Winnie, I love your post and I would absolutely love to win a copy of A Family for Christmas. Thank you for the opportunity. One of my weaknesses is sweets so I know I would have had such a time working in a confectionery shop. The bright colors and the beautiful tastes and textures...yep, I would be a goner! 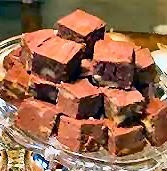 My grandmother use to make old fashion fudge like your recipe, what wonderful memories that brings back. Milk chocolate is my favorite so anything dipped in it or used with it is good to me. Thank you again! Winnie I really enjoyed your post today. I grew up in a small town that the pharmacy had a homemade candy counter! Am I showing my age? lol ! Your fudge recipe is similar to the one I made for my mother every year for Christmas except I used vanilla instead of almond extract. It brought back some good memories as I haven't made it since she passed 15 years ago. I will put your book on my reading list as it sounds wonderful Thank you. Hi Jackie! I think this old fashioned fudge recipe was a staple back in the day - I know I got it from my own mother. And yes, making it certainly brings me back to my own childhood. Thanks for the kind words about my book - your name is in the drawing! Winnie, I've enjoyed your books from the time I read The Christmas Journey a few years ago, and look forward to this new one. My grandmother made the best divinity, but I just didn't inherit her cooking ability, unfortunately. And now we have to eat sugar-free for the most part, but your recipe sounds easy and would be fun to use for company. Thanks for sharing the recipe and an opportunity to win your book. Oh Carole, what a sweet thing to say!! There is definitely an art to making Divinity fudge and it's something I never mastered. My mother, on the other hand, can do it to perfection!! Sounds yummy! I love most anything chocolate, but I do love a good truffle. Like the ones from Harry & David. Patty - Oooooooo yes on truffles!! The melt-in-your-mouth richness of them is sooooooo fabulous! Ooooooo, I love seasonal fiction! A good Christmas story just sets the tone for a beautiful Christmas season. I would love to read your work! (I'll also add a review of it to my blog and let you know of it, if I am chosen.) God bless you! I (obviously) love seasonal stories too - in fact my editor has already approved another one for 2014! Your name is in the hat for the drawing! I was surprised to learn that gum drops and other such confections were available back then. I always think of the hard candies in relation to old time confectioners shops, too! I love chocolate of all kinds. Brownies, fudge, chocolate candy! But I am a chocolate purist, I do not want nuts added to my chocolate! Thanks for these chances to win your book. Brittany - I'm with you - do not like nuts in my candy. It's not an accident that there are no nuts in my fudge recipe - when my sister makes she adds pecans! Winnie, I enjoyed your posting. It's amazing to me that popcorn was considered a candy. I love chocolate and caramel together with or without nuts. I love turtles. Thank you for the opportunity of your giveaway. Please enter my name. Ooooooo chocolate and caramel, yum! a match made in heaven. And no fears, your name is in the hopper with the rest of them. I don't eat much candy anymore but if I do I like my chocolate with nuts in it. Thank you for the chance to win. My daughters and I love to make chocolate covered peanut butter mint balls for special occasions. Love your books! Ooooooh - that's sound yummy! You must share the recipe. ... chocolate covered peanut butter AND mint balls not all in one! Would love to win this book! I love Christmas stories! My mom makes pecan tarts at Christmas. Love those! My grandmother used to make them. Will be looking for your 2014 release as well! Thanks for the chance to win! My mom makes something very similar to what you described but I'm not a fan of pecans I'm afraid - I know, very unSouthern of me. I love Christmas and everything that comes with it including stories...would love to win. Thanks for the fun post - I love sugar cookies plain and simple. Hi Eliza - thanks for stopping by and I have your name in the hopper! Loved reading about the confectionary stores, Winnie, & I think every tooth in my head must be a "sweet" tooth! My favorite confection is peanut butter fudge, ANYTHING peanut butter - actually. One of my favorite memories is of my grandfather serving many different kinds of candy, every Christmas, at family gatherings - he would go to a store, where the candy would be stored in huge containers, rather than wrapped, & have bags (1 # each?) filled of each kind. It was always a treat when he would bring out his candy (after dinner), & pass it around. I love Christmas books, & buy a new one every Christmas. Am attracted to the storyline of A Family For Christmas, as I used to work in a children's home. Would love to read it - thanks for the opportunity to win a copy! Hi Bonnie - thanks so much for sharing those memories of your grandfather - he sounds like a very special gentleman. Hi Kathleen - I've heard about taffy pulls but have never witnessed or participated in one - sounds like fun!! And I'm with you on truffles - melt in your mouth goodness! Christmas stories to me are all-year-long delights. It doesn't have to be November or December for me to enjoy reading about Christmas. I'd love to read and review your new release, A Family for Christmas. Thank you for your offer. Hi Nancee - glad you stopped by and I'm tossing your name in the hopper now! Thanks for the fun post that seemed to go straight to my hips! I'd have to say that fudge (no nuts) has been, is, and always will be my fave confection. Looking forward to reading this new book and thank you so much for the chance to win it! Hi kam - a gal after my own heart!! And thanks for the nice words about my book! Got your name in the hat! Thanks everyone for allowing me to share this post with you - it's been great fun discussing our mutual enjoyment of sweets! I've randomly selected the winner of my giveaway and it was Jackie McNutt - congratulations Jackie! !